Canon has explained the decision behind its 22 million pixel sensor on the 5D Mark III, after many were expecting it to closer match the Nikon D800, which houses a 36 million pixel sensor. 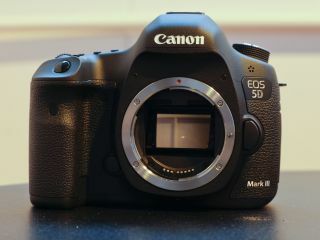 The 5D Mark II has only one million more pixels than the predecessor, the 5D Mark II, leaving many to question whether the new camera is enough of an upgrade. However, Canon UK's David Parry believes that 22 is enough, and education needs to be done to convince consumers of that. "I think there's difficulty with having higher megapixel counts. What we tried to do is create a camera that's good for all types of photography," he told TechRadar. "We feel that this is an ideal number for this type of camera, if you're a journalist, or sports photographer, you need to get the images off the camera quickly, and they need to be as sharp as they can be. "It's OK [higher megapixel counts] for studio photographers, but that's not who we envisage using this camera," he explained. The 5D Mark III is currently the highest resolution DSLR available in the EOS range, which is outgunned by the Nikon D800, which is the world's highest resolution full-frame DSLR. At the time of launch, Nikon claimed that it was aiming the D800 at medium format users along with studio photographers, so it seems that the two companies are not strictly squaring off against each other in what could be called semi-pro territory. "People assume that more megapixels is a good thing," Parry said, "But there still needs to be some education so consumers understand the drawbacks." It will be interesting to see how the Canon EOS 5D Mark III compares with the Nikon D800 when full review samples come in for testing.